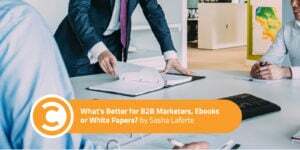 What’s Better for B2B Marketers, Ebooks or White Papers? Content marketers rely on high-quality content to generate leads. In fact, last year 85 percent of B2B marketers said lead generation was their most important content marketing goal, according to the Content Marketing Institute. But it’s not enough to just slap any old brain fart behind your landing page. What kind of content is best to hit your lead gen goals? It’s whatever motivates your audience to volunteer their name, email address, and/or other information. It needs to be something substantial, with information they can’t find anywhere else. Sound familiar? If you said white paper or ebook, you’re right! According to ImpactBND, 80 percent of users said they’d provide their email for a white paper or ebook. Consumers are even more likely to share their information in exchange for white papers (76 percent) than ebooks (63 percent). White papers and ebooks, however, are not the same thing. What’s the difference? Like a white paper, an ebook addresses a hot topic. But while a white paper generally presents original research or findings, an ebook can include original content, collect or mine product reviews, or curate content that has appeared in other formats. For example, a common form of ebook repurposes blog posts and adds additional related information from industry experts and thought leaders. Here’s a quick summary of the differences between ebooks and white papers. It comes from Ann Handley, MarketingProfs Chief Content Officer and co-author C.C. Chapman’s book, Content Rules. Both ebooks and white papers offer many potential benefits. They are typically more time-consuming and expensive to produce than blog posts. But whether your goal is to generate leads, increase brand awareness, or educate customers, gate this valuable content so that you can collect visitors’ information. Here are four reasons to add eBooks or white papers to your content strategy. Ebooks and white papers are two of the best ways to generate leads, especially for B2B marketers. B2B customers now have access to many sources of information before making a purchase. They like to make use of them. The sales cycle can be long, and you need timely, relevant, and useful assets that motivate readers to download a copy and return to your site for more. An ebook or white paper with exclusive content can define a category or present unique information or reflections on an industry. This builds thought leadership. Many experts use ebooks as calling cards to generate speaking engagements and appearances at industry conferences. Even if it’s self-published, an ebook burnishes your reputation. Ebooks and white papers help educate customers so they can decide if your product or service is right for them. They can also help customers use your product or service, and get the most out of their investment. An ebook or white paper can provide detailed insight into an area of expertise that connects your company with a particular audience. Tailor the contents to their specific needs by addressing the pain points of a particular persona. This helps engage customers and turn them into brand ambassadors. Which would your audience prefer? Are they looking for information that’s easy to absorb and quick to implement? Or do they want a detailed dive into a niche area of the topic you’re covering? The more specific your audience’s interest, the better a white paper will meet their needs. Which is better for this type of content? Is your topic a high-level overview? Can it be broken down into actionable steps? Or does it require supporting details and deeper explanation? Information that can be presented in scannable chunks is better suited to an ebook. What time and resources do you have to create? White papers can require a significant amount of original and third-party research. That’s not to mention lead time for gathering quotes, creating graphs, and organizing visual depictions of data. If you don’t have the time to devote to a white paper, then an ebook will be a better bet. Review the differences between these content types, weigh their benefits, and select the format that’s best for you. When you’re ready to start building, check out Curata’s white paper template or ebook template to help you get started.